"Loved the u-pick. Amazing flavor...It's a YAAAAS for me! "Steph J. Proudly offering locally grown produce, cultivated with love and care using natural and sustainable farming practices. Spend a day out on the farm with family and friends enjoying the fresh air and plenty of ag-ventures. 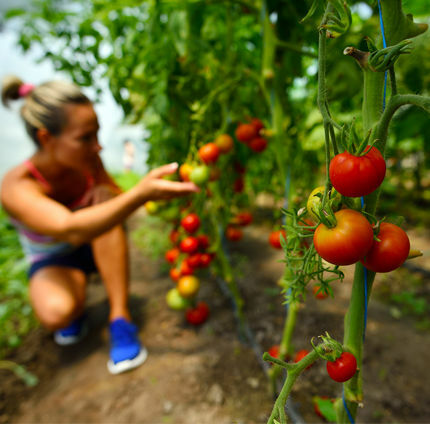 While visiting, we invite you to enjoy the wonderful experience of picking fresh vegetables on our farm. Fresher is better, come taste our homegrown difference! Since ripening schedules and crop availability are not an exact science, selections will vary, with some items only available pre-picked in our market. The u-pick garden is open during the same hours as the farm park mid-June through the end of August. Our farmers begin gleaning ripe and ready vegetables from the fields at 2PM on Saturdays. This produce is still available for purchase in the farm store, but may not be available for a u-pick experience. Check-in at the farm store, then head to the field and grab a basket. You may pick what you want straight from the plants, being careful not to damage them. Once done picking, visit the cashier in the farm store to pay for what you've picked. Not sure how to pick? No problem. Alert the cashier upon arrival and she will request a farmer come to offer assistance. It's fun and educational! Free access with paid park admission. Free access with season pass. Please know, picking pass fees for field access go directly towards paying our great staff and keeping our farm productive, beautiful, clean and open for the public to enjoy. Prices range from .25¢ to $1.00 per stem. Precut arrangements available in farm market store. NOTE: Access to the Cut-Your-Own Flower Garden is ONLY available to guests purchasing admission to the farm fun park and season pass members. We apologize for any inconvenience. Breeding healthy, genetically sound, friendly disposition show and pet quality livestock for hobby farms. PETTING FARM. PONY RIDES. FAMILY FUN FARM PARK. U-PICK GARDENS. FALL PUMPKIN PATCH & CORN MAZE.